trottas, originally uploaded by jahansell. As promised, I'm planning a week-long or so photo essay about the current status of the business community in Sharon - reflections on the downturn, the prospects for revitalization, and how small businesses can thrive in small towns. If anyone out there is still reading this (unlikely since I stopped posting months ago) I welcome comments and a dialogue! So, as not to bury the lede: Trotta's, the supermarket in the shopping plaza, is closing. The owners were in business overall for 61 years, 25 at this site (or so I gather - note that i did no reporting for this "story!") It reminds me so much of my grandparents' clothing store in Salem, Ohio - they had it for 63 years. My uncle carried on for a while after they died, but when he wanted to retire there were no more Hansells who were interested in Ladies Ready-to-Wear, so he closed it. (Actually my sister did end up going into the "family business" but she was too young at the time to take it on, plus she would have never wanted to live in Salem!) The end of an era. I'll be honest: Trotta's wasn't the world's best grocery store, and it was a common sport in town to complain about it - especially the produce department. And I will not mention here some of the encounters I had with surly employees over the years - 99.9% of the time the people working there were perfectly friendly - mostly local teenage girls, all of whom will now have to find jobs - but where?. And I know the Trottas made a point of hiring special needs teens from time to time as well., AND They did a lot to support local non-profits, the food pantry, etc. Despite the grumbling, I realized, walking through the other day looking for bargains (everything that's left is 25% off) just how much I depend on having it there - how often I've realized in the middle of making dinner that I need a lemon, or a jar of anchovies, or that we're low on juice for the morning. If I had to drive to Freshtown in Amenia, I'd probably just go without. I have another soft spot for Trottas: when I first moved up here, I didn't know ANYONE. And for the first year, I barely met anyone either - I was telecommuting, going to the city once a week, and my efforts to meet people had mostly fallen flat. Then my daughter was born, and I became desperate to see other adult faces. I made up an excuse to drive to town just about every day, usually because I needed to pick up this or that at Trotta's. Nobody knew my name, still, but they knew hers: she was that beautiful baby with the huge blue eyes, and I was "Abbey's Mom" - an after-thought, but at least I was having a conversation with somebody! So thank you, Trotta's, for helping me keep my sanity during that long cold winter and spring of 1999! The space hasn't been re-rented yet, and it's impossible to say whether it will be a grocery store again in the future. I did get an email from a friend last night suggesting we all bombard Trader Joe's with the suggestion that they open up here - they're looking for new locations. How awesome would that be! 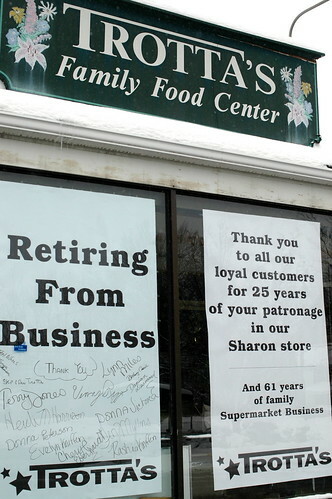 They have ones in Danbury and Hartford - too far to go for groceries - so why not Sharon?? Well, I know why not - they like bigger cities. But we can dream - about Two-buck Chuck, chocolate covered macadamia nuts and all the rest! Trottas has been the anchor of the shopping plaza, that odd little blob in the middle of town that holds the post office, a couple of banks, a laundromat and a now-empty clothing store. More on the plaza tomorrow. As a 20-something native of Sharon who now lives elsewhere, it's strangely comforting to return home for various holidays and find everything exactly as I left it -- both beautifully and depressingly undeveloped. Like many Sharon residents past and present, I have a love-hate relationship with that shopping plaza -- at any given time, it's housed both the best and the worst local businesses. Much of its charm was that nothing about it ever changed. This Christmas, however, I'll be looking into vacant display windows at Clothes and Collectibles and buying out Trotta's remaining inventory with everybody else. It's heartening that two new cafes have opened up in the last year, replacing existing businesses. But it's sad that the changing storefronts I see this holiday season will be empty ones. As for year-round Sharon residents, I think a new Christmas carol might be in order -- "All I Want For Christmas Is a Grocery Store." You cannot know the pain it causes me to admit that I am a mere mortal (and that the magical elves on my staff have little respect for my authority or their salary packages. Consequently, the reindeer are all filthy and out of shape and the elves that have shown up for work all seem a little worse for wear, if you catch my drift. All they seem to do is sit around smoking, playing cards and telling dirty jokes! Anyway, myself, Henry and Ezra, would dearly like to wish you a Merry Christmas/Winter Solstice/Hanukkah/Festivus and a happy New Year! We hope that all of your holiday photos turn out to be triumphs, your Yule logs firm and that Santa treats you kindly this year! Trader Joe's would be awesome, but as you suggested, they need higher traffic to be compatible with their business model. There was talk a few years ago of Guido's buying out Skip Trotta and moving into town, but alas it was not to be. As I noted in my own blog, the fact that Skip was not able to find a buyer and had to liquidate does not bode well for finding a new tenant anytime soon. Unfortunately I suspect there are a lot of people living in Sharon who are content with the fact that there isn't much there except for a hospital. It's sort of pathetic, really. But they like it that way. Maybe you could bring back Hansell's Ready-To-Wear and move into Skip's old place! Trader Joes would be the best for sure, but like you said we can dream. Even an IGA run by locals has the potential to be really good. Well, it's true - not every town needs a bustling downtown - there are plenty of bedroom communities, and we can shop in a plethora of nearby towns. But if you're going to have shops at all, they should be well designed and user-friendly. And we're stuck with the plaza now, so we might as well have something wonderful there! In response to Terry's comment -- I think he's largely correct that some Sharon residents, native and otherwise, have been content to keep business out. I think the emptying of the plaza, though, may start to change those individuals' minds. I remember the original Trotta's in Millerton in a small store near the movie theater. Joe Trotta moved that store into what is now Sapersteins. I was young and remember getting a job stocking the shelves of the new store. Then it was moved to the new plaza and I am not sure what it is called now. When Joe Trotta was alive and running the business is was very well run. I lived in Ithaca, NY for 4ish years, and I miss Wegmans terribly! I live within walking distance of a Whole Foods now, but it's just not the same. Trotta's closed?? I just discovered this blog while searching for something for work, and I was pleased to read all about this little town where I spent a summer working for the theater on the edge of town. It was such a great town, but not having a car there, I was pretty much stranded, and Sharon can get pretty irritating when you can't leave. But I always jumped at the chance to ride with somebody to Trotta's, it was like my oasis. An escape from the theater for a minute or two. Their great deli made my lunches practically every day! Sure, it wasn't the greatest, and trying to park was often suicidal, but it was such a big part of my memories of that summer. Even though I'll probably never get to return to Sharon, I'm so bummed to discover that it's no longer there. Well, I'm going to get back to reading more of this great little blog, see what else has changed since my summer in Sharon.